Enjoy free unlimited on-the-go power with this Willone solar panel backpack! 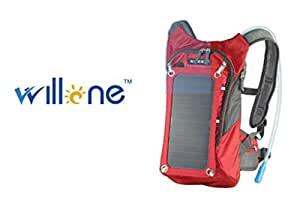 This solar charging backpack uses the power of the sun to keep electronic devices such as smartphones, GPS units, tablets, E- readers, Bluetooth speakers, cameras, and more powered up and ready for use. This is the perfect choice for any outdoor or travel enthusiast, who doesn’t have easy access to a power outlet. It comes with plenty of pockets and compartments for maps, documents, and other essential gear. It’s made of a high-quality, rugged fabric making it great for backpacking, trekking, mountaineering, fishing, biking, and so much more. This fabric is made of a rip and polyester. The design has stress points that are reinforced with bar tacking for increased longevity and padded straps for comfortability. Also, since it is a ultra-light and ultra-durable, it’s an ultra-awesome backpack that is perfect for day-to-day use, outdoor activity, or travel, making it a great gift for any age as a daypack, hiking backpack, school bookbag, or even as a functional travel bag.